Information – the idol of the current generation. Its absolute status is shown in expert scientific circles, where it helps to find answers to the questions forcing mankind from ancient times. Who we are, from where we come from, where we are going? DNA is a source code of human existence. Modernistic understanding of information hegemony has shown that if we are able to decipher the entire human genome, we will know the essence of life. Postmodern experience showed us the opposite. The body is established only from information without which one would not be the human. At the same time, if the one is created only from information, maybe the right content is missing. 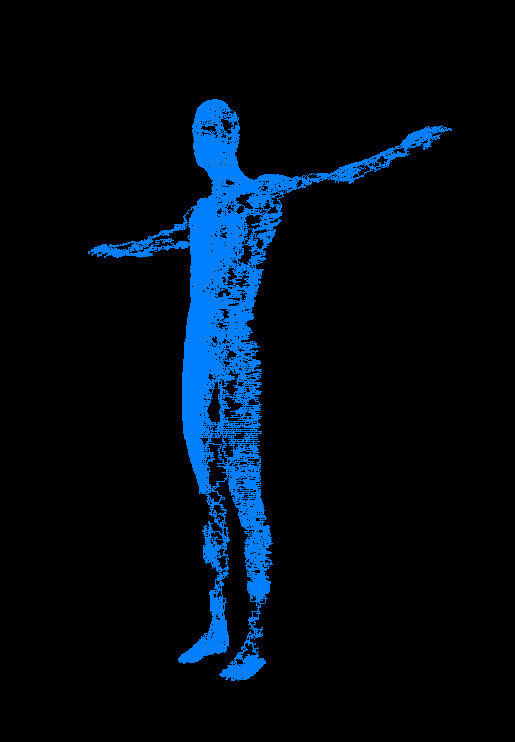 3D scan of the human figure is completed by rewritten human genome (3,000,000 characters of nucleotides ACTG). The same software as for the work “In the beginning….” was used for rewriting ACTG characters.